The Funky Felter: I WON!! My heart flutters a little as I post this because I won something truly amazing over the weekend! I am still in shock about it! As many of my loyal reads know, I purchased a wonderfully crafted fine drum carder from Ron Anderson of Fancy Kitty earlier in the year. I had been wanting one for ages and was finally able to save up the money to buy one. Around the same time that I made the purchase, I joined the Fancy Kitty ravelry group and have become an active member there. It is probably the nicest bunch of fiber fanatics that I've been a part of online, and they discuss all kinds of fiber related topics there so it is a great place to learn. Ron is also very generous and does a giveaway regularly that is usually based on a new membership number milestone at the ravelry group. When the group hit 300 member last week, Ron did a fantastic giveway through an elimination drawing. Guess who was the last name left? YEP! IT'S ME!!!!!!!!!! I WON!!!!!!!!!!!! WOOHOO!!!!!!!!!!!! I had the choice of a drum carder or a picker. Although I already have a lovely fine drum carder, I really wanted another one that could do art batts and thicker fibers. 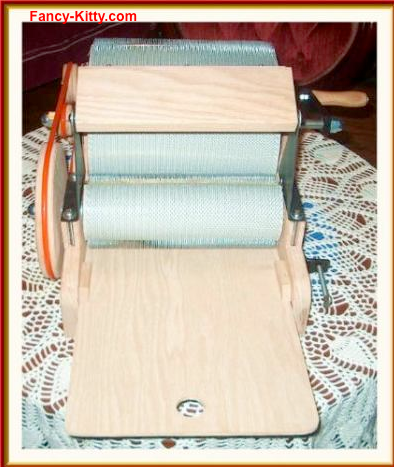 I chose the medium 72/90 drum carder as my prize. (A picker would have been nice too, but as a city dweller for now, I really have no storage place for it.) Well, I just got an email notification today that Ron mailed it! Its on the way! I truly feel blessed to have won such an awesome prize! And, I can not say enough good things about Ron as a person and craftsman. His drum carders are wonderfully handmade! His customer service can not be beat! He's also the most generous businessman that I've encountered online. Please take a minute to visit the Fancy Kitty site. I also highly recommend that you join the Fancy Kitty ravelry group if you are at all interested in his products (you don't have to own one to be a part of the group). When the drum carder arrives, I'll be sure to post about it eventually. Although, I'll probably be quite busy carding lovely batts for a while. I wonder if I can crank one carder with each hand? Hmmm... LOL! And, a BIG thanks to Ron for his generosity! Wow, that's awesome!! Good for you!! Oh congrats. That is just wonderful! Congratulations! I am SO envious, though, as I am just beginning to save for my own Fancy Kitty drum carder....maybe by Christmas I'll have it all together! Congrats! You sure deserve it! Looks like your going do develop some great muscles with this. Well, I've got to use it a few times now and it cards wonderfully as does my original fine drum carder :) I need to get better organized so that I can find time to card every day!